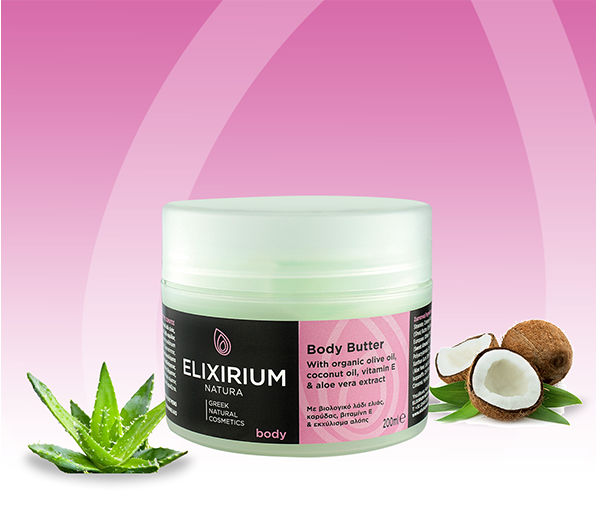 ELIXIRIUM NATURA - BODY BUTTER. HomeElixirium NaturaBODYELIXIRIUM NATURA - BODY BUTTER. 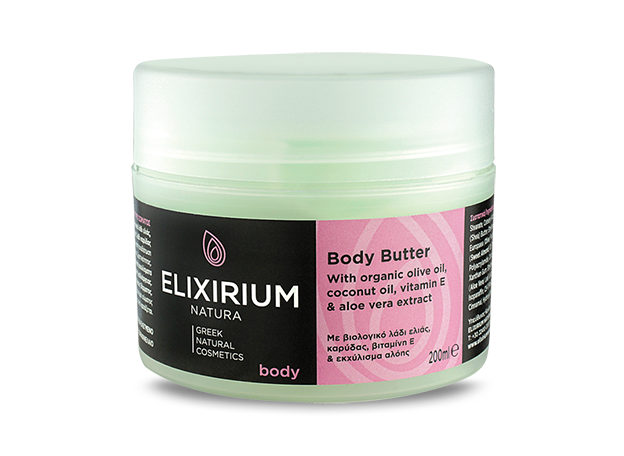 Rich body butter with organic olive oil, vitamin E, shea butter, cocoa butter, coconut oil and aloe vera extract for maximum hydration and elasticity. 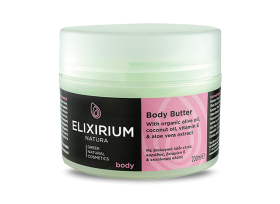 Use: Apply the body butter to the whole body as often as needed. Συστατικά/Ingredients : Aqua, Ethylhexyl Stearate, Glyceryl Stearate, Cetearyl Alcohol, Cera Alba (Beeswax), Butyrospermum Parkii (Shea) Butter, Ethylhexyl Palmitate, Glycerin, Cyclopentasiloxane, Olea Europaea (Olive) Fruit Oil, Phenoxyethanol, Prunus Amygdalus Dulcis (Sweet Almond) Oil, Theobroma Cacao (Cocoa) Seed Butter, Polyacrylamide, Cocos Nucifera (Coconut) Oil, Parfum (Fragrance), Xanthan Gum, Ethylhexylglycerin, Imidazolidinyl Urea, Aloe Barbadensis (Aloe Vera) Leaf Juice, Panthenol, BHT, Tocopheryl Acetate, C13-14 Isoparaffin, C9-11 Pareth-6,Linalool, Lilial, Amyl Cinnamal, Hydroxycitronellal, Benzyl Salicylate, C.I. 19140, C.I. 42051.